When Walt Gdowski, owner and CEO of The Rough Notes Company, and Bob Kretzmer, executive director of The Rough Notes Company Community Service Award, conceived the idea of the award in 2000, they probably did not envision the variety of charitable services for which independent agents would be honored throughout the 17 years of its existence. Many of these philanthropic endeavors were based on a personal component: a visit to a third-world country spawns an effort to alleviate starvation; an agent invites a friend’s grandchild who was born with cerebral palsy to ride a horse on the agent’s farm—and a therapeutic horseback riding clinic takes shape; an adult autism community living facility comes into existence because an agent’s autistic daughter has aged beyond childhood. This year’s award goes to a person whose desire to give back to his community was born out of his own lifelong struggle with the aftermath of childhood sexual abuse. It has been a long struggle, which award recipient Wayne Coffey, president of Coffey & Co. in Hunt Valley, Maryland, chronicles in his short but powerful book No More Stolen Childhoods. To ensure that young victims of sexual abuse will be able to reveal and deal with their experiences has become Wayne’s primary purpose in life. 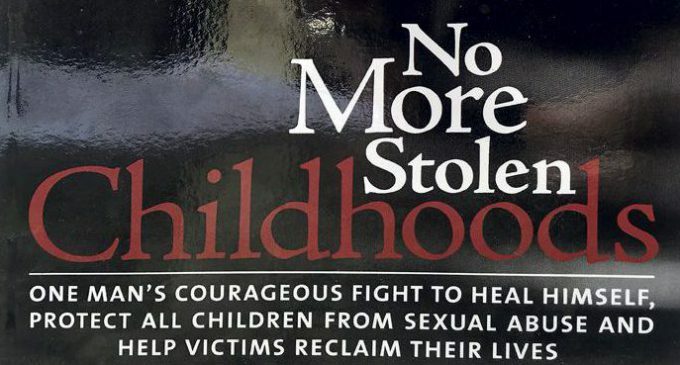 To help achieve this goal, he founded a nonprofit organization that bears the same name as the title of his book, No More Stolen Childhoods (NMSC). D. Wayne Coffey, agency owner, nonprofit founder, and author, holds the 2017 Community Service Award sculptured eagle trophy. Second, his years in Scouting provided stability, as well as an opportunity to find solace in nature and an escape from the offending person. Meetings and campouts often fell on days when the family, including the abuser, got together. Most of all, however, Wayne soaked in the ideals and call to leadership that Scouting provided. A Scouting youth leadership training program taught specific leadership skills that boys were encouraged to apply at home, in the community, and, as Wayne later discovered, in their adult lives, too. Having believed that he had dealt with his experiences and put them behind him, Wayne did not realize that his adult explosions of temper on certain days of the week, strange reactions to particular odors, and a burning desire to be the best and achieve perfection were adult manifestations of the effects of the abuse. As a result, although he had become a successful and respected businessman; was blessed with a loving and caring wife; interacted with and doted on his children, there always were those strange reactions that seemed to have no cause. Then, in 1998, Wayne encountered the first of two instances of what some would call a moment of serendipity and what others might refer to as a “God-thing.” At that point, his firm, Coffey & Company, was growing. “I was on top of the world professionally,” says Wayne. “Personally, however, I was imploding. Like a black hole, I was sucking my family into my continued rage.” His marriage had reached a crisis point. Wayne immediately sought counseling, and decided to prosecute his abuser. His counselor helped him understand “how deeply childhood sexual abuse wounds the soul and psyche. It’s not something you get over because you’ve done counseling. The experience is who you are,” Wayne says. And, he notes, lack of trust is an issue that lasts a lifetime. A week later, while at a professional insurance retreat in California in 2004, Wayne and his wife visited the farm of the famous horse whisperer, Monty Roberts. Despite witnessing Monty’s breaking of a wild mustang through the use of his Join-Up method, which was based on trust rather than force, Wayne remained skeptical. Through the sort of sixth sense that abused people seem to acquire, Monty, who by the time he was 12 had suffered 72 broken bones, intuited that Wayne was in trouble and convinced Dolores that he could help him if they came back to learn his technique. At that point, back in 2004, the seeds of his not-for-profit, No More Stolen Childhoods, were planted. All that Wayne had learned in Scouting, at school, and at church crystallized: use your talents to help others. In Wayne’s case, there was more. He was challenged also to draw upon the dark days of his childhood to accomplish that. Paraphrasing a Bible passage, he says, “Good can always come out of bad if one chooses to allow that to happen.” He could become God’s vehicle. How does the organization do it, and how does Wayne’s passion play into his business? First, there are countrywide presentations where, despite the pain it brings him, Wayne speaks out publicly about his experiences. There is an educational program, titled “Safe Kid Club,” which includes a coloring book—the Safe Kid Club Coloring Manual—that was carefully and artfully crafted to help children understand if and when they are being abused and, most important, what to do about it. Schools, civic organizations, sponsors, and parents are encouraged to “join in our effort to empower children to stay safe from predators,” it says. There also is the book mentioned earlier in this article. And, finally, there is the life-changing video, More Than Stranger Danger: Understanding the Reality of Child Molesting. As part of his campaign, Wayne invited insurance carriers into the office to share the video. Members of the staff, who also had been invited, were so stunned by Wayne’s testimony that they immediately jumped on the bandwagon. “I’m absolutely blessed,” says Wayne, speaking of those employees who often provide administrative support to NMSC. For example, Brianne Fritze worked with the nonprofit’s executive director on a fundraising dinner that featured the video and also provided marketing materials at another fundraising event. And another employee, Katy Nash, nominated NMSC for a grant that would provide funding for the organization. If Wayne feels blessed because of the devotion of his employees, they, if asked, would probably say that they are blessed to work at his agency. Committed to “changing the perception—and reality—of the insurance agency system,” Wayne operates under three core principles: integrity, professionalism and competence, all an outgrowth of the formative childhood experiences that were in direct contrast to the abuse he had suffered. To sum it all up, Wayne says, “I will never say, ‘Oh, woe is me.’ I can overcome and live a life that is giving back. To share is to relive and it is painful. It’s difficult at times, and I need an occasional break. I can’t do it full time.” The “breaks” are made up of, first, his family, second, his business, and then myriad community activities.